Jasmine Tookes’ crochet top, Ashley Tisdale’s sleek monochrome look, and Mandy Moore’s standout sneakers are all available for less. Every week, I scour the web to find inspiring outfits on your favorite celebs and help you recreate their looks! This week, I was inspired by Jasmine Tookes, Ashley Tisdale, and Mandy Moore. Read on to see how you can get their looks for yourself. Model Jasmine Tookes turned heads while out to lunch in a colorful, laid-back look. Jasmine wore a bright, multi-colored crochet statement top with some ripped, paint splattered straight-leg jeans. She accessorized with chic pieces including some black loafer flats with a gold metal detail and a small, structured black handbag, along with gold and red tinted sunglasses. 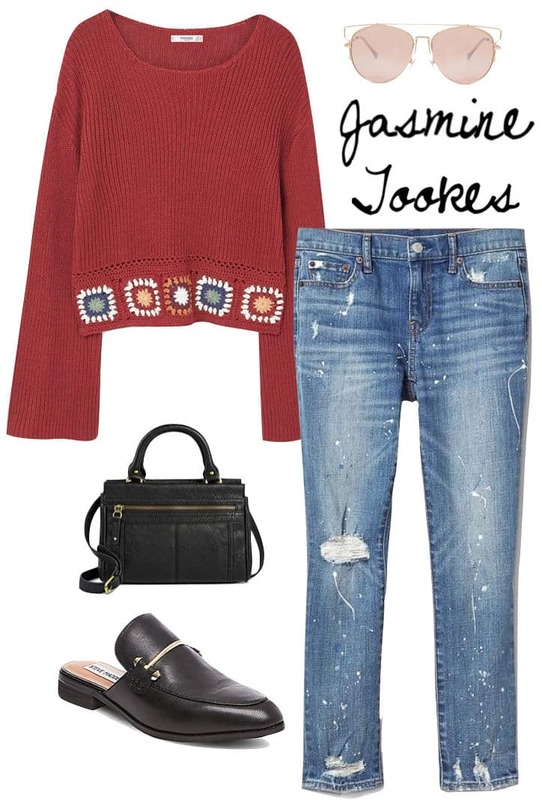 Jasmine’s ensemble stands out while still being relaxed for a day out about town. This trendy look is excellent for spring and summer with its vibrant colors and crochet texture. Pair some distressed paint-splatter jeans with a statement top featuring colorful crochet: this crochet panel sweater is a perfect stand-in for Jasmine’s, even featuring the same floral crochet design in similar hues. Bring the ensemble together with trendy accessories like some cutout aviator sunglasses with pink lenses, a structured mini handbag, and some backless loafer slides, which are easy to slip on yet look polished. Actress Ashley Tisdale stepped out in an all-black monochromatic ensemble with cool metal accents. Ashley looked sleek in a simple black tank midi dress, giving it flair by pairing it with some heavily studded black ankle boots and a black bowler bag. She rounded out her outfit with round sunglasses featuring light brown lenses. This look is great for those of you who want a minimalist wardrobe. Ashley’s dress can be styled a bunch of different ways, making it a super versatile piece to own. This calf-length tank jersey dress is a budget-friendly dupe of Ashley’s and is an awesome investment because switching up your accessories can transform it into countless different looks. For Ashley’s sleek look, rock some standout booties with metal studs and buckle detailing. Accessorize with a black bowler bag (this one features gold metal hardware similar to Ashley’s) and some large gold metal sunglasses with light brown lenses. As a plus, this ensemble can go from day to night – just add a faux leather moto jacket and swap the bowler bag out for a clutch. Mandy Moore was all smiles while traveling, wearing a cool, casual ensemble. Mandy wore some light wash straight leg jeans with a plain gray sweater and a black mid-length coat that had a blazer-like feel. She gave her simple, preppy-chic outfit a casual twist with navy blue high-top sneakers, along with a Gucci crossbody bag and dark sunglasses. 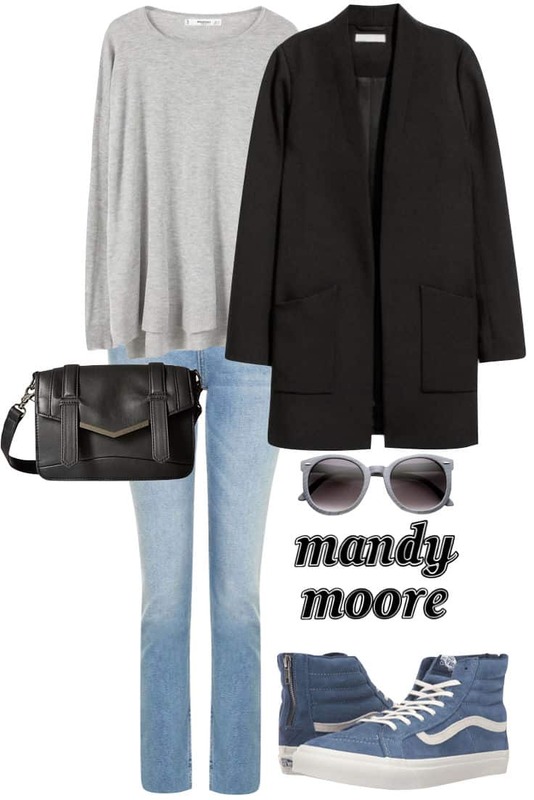 Mandy’s outfit is cute yet practical, and perfect for spring. Mandy’s look is great for a day spent out with friends or family, or for class. Wear a pair of light wash straight leg jeans – light wash denim has a spring feel to it – with a simple gray fine knit sweater or top. A black mid-length straight-cut jacket is a chic way to bring some structure to the look and makes for a versatile wardrobe addition. For a fun touch, wear some unexpected high-top sneakers in blue or a different color. These Vans SK8 High Slim Zip sneakers have a similar look to Mandy’s, and make the outfit stand out. Complete the look with some cool sunglasses (these match the sneakers) and a chic-looking crossbody bag.